Get ready for duck season, and the holidays, with this wonderful recipe. Maybe this Christmas you can serve up something a little different than the same old turkey or ham that so many households across the country offer their guests. Duck breasts are fancy enough that some house guests might think you went overboard, but if you are a hunter, duck is hopefully plentiful enough that serving up a bunch just gives you more reason to get back to the blind. 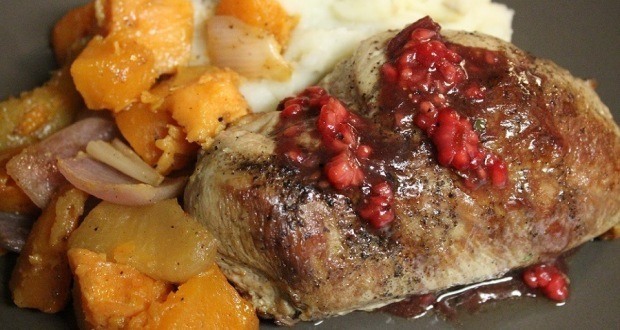 These duck breasts with raspberry mushroom sauce recipe is very easy to make. When it comes right down to it, it’s just a pan sear with a throw-together pan sauce that tastes absolutely amazing. Paired with some common late-fall veggies and some mashed potatoes, and you have a feast that five star restaurants would be happy to serve.